In a record-breaking winter maneuver, we’ve plunged below zero here in Albuquerque. The ever-present sun masks a cruel truth: It’s wickedly cold outside and most local critters aren’t prepared. This morning, I knocked on my hive and listened. With an ear to the wood, I thought I might hear the faint crunching of a cluster of bees huddled inside. SILENCE. And so, I must wait, like a mama eagle teaching her fledgling to fly — I supported you well and this, you must survive on your own. It’s tough love, to be sure, but if Albuquerque is to support honeybees for the long haul, I believe the species must adapt to local conditions without human intervention. And so I wait. The first warm day above 50 will bring me news of their survival. UPDATE 1/18/13: The weather has broken and my girls took to the sky today as only critters with cabin fever will do. They’re alive! A stethoscope makes a world of difference when trying to listen for winter activity. It’s certainly reassured me on a number of occasions. Excellent idea! I think I’ll try that just to quiet my worry. Thanks Gordo. How are the girls faring up your way? They sound ok, that’s for sure. Sometimes, especially with the top bar hives (they’re built with heavier wood), I can only hear them if I put the stethoscope up to the entrance. We’ve been into the deep freeze, back up to 11C and are heading back down to -18C this week. My bugs have pulled through the past bunch of years, with proper wind protection and deep and medium supers of honey they’ll make it. I’m up here in Helena Montana. We’ve had the deep freeze on and off, they generally make it without problem. I appreciate the vote of confidence, Paul. Like you, I leave ’em extra boxes of honey (this hive is 3 deeps), which has worked well for me in the past, so I remain hopeful. A stethoscope is a brillant idea. We’ve been having some cold weather lately (for Austin), and I always worry about my bees. Luckily, these only last for a 4-5 day stretch and then we usually get at least a day or two in the upper 50’s when I can verify proof of life. Hang in there! Hope you get good news. 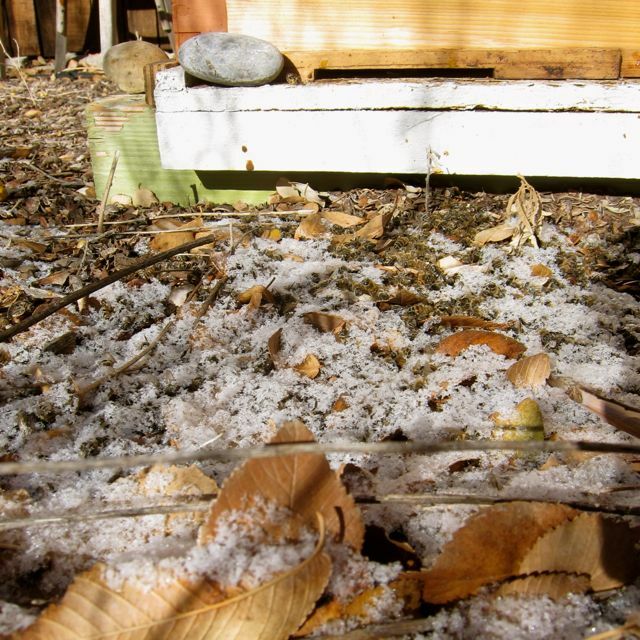 We have lost one of our two hives this winter. The other still seems to be doing well so far but spring is several months away. I am keeping you and your girls in my thoughts. I just lost my hive and had to clean out my poor girls on Sunday. I’m in Nashville and the weather has been just crazy. We had some really wet weather that then plunged in temperature. This was my very first hive (a top bar hive) and they really never fully got off the ground. I did everything I could for them. So it’s sad. I will just try again come spring. I sprinkled my girls over the bulbs that I had planted for them in the fall. I am hoping their sacrifice will help give the new girls a head start. The beauty of beekeeping. As much science as it is art. After 15 years of keeping bees, you can never predict with absolute certainty. 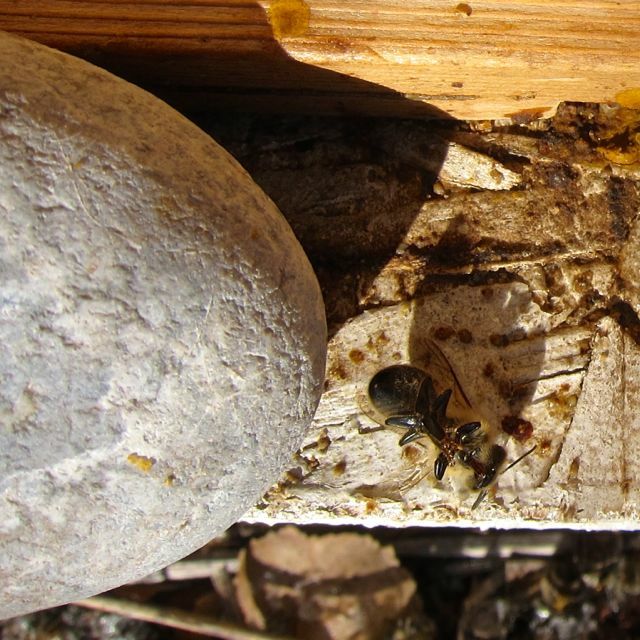 Here in Norther Ontario, I have had full size hives die out half way through the winter for no reason, yet have a weak hive I had written off make the winter and bounce back in the spring. I even had one hive lose its cover and inner cover, the top box packed with snow. Somehow the bees survived the winter, and made it to the summer without a problem. Its up to the bees and not much can be done other that wait and hope. Thanks for the good words, everyone! I was able to borrow a stethoscope and so will attempt to hear what I can hear later this week. With two hives in the neighborhood (one in my yard and one at my father-in-law’s), I’m hoping at least one has pulled through. Like Allen has said, it’s surprising which hives survive sometimes. Last year, in fact, I’d completely written off this tiny hive comprised of only one deep and yet BLAMMO! come spring, they were thriving. What a delightful surprise. Best of luck to your colonies as well — whether in Nashville, Montana, Austin, or Ontario — may they stay well-ventilated, well-fed, and warm for these few remaining months of Old Man Winter.